company logo, we ask that you take a moment to ensure you're sending us the highest quality image you have. 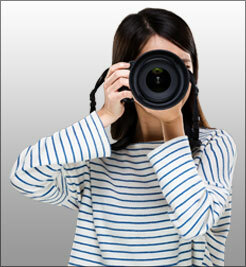 • Photographs should be taken at the highest resolution available on your digital camera. We recommend a minimum of 8 megapixel cameras for small to medium murals and a minimum of 12 megapixels for large size wall murals. Up-sampling (i.e. artificially increasing resolution using software such as Photoshop) will not increase the output quality of your wall mural. Digital SLR cameras take the best photos for high quality wall murals. • While newer smartphones and tablets offer "high-resolution" cameras as high as 13 megapixels or more, these images typically exhibit artifacts and noise as a result of having smaller image sensors than traditional cameras. When enlarged, these artifacts become pronounced, making many of these smartphone images a poor choice for wall murals. • Images found on other websites and search engines such as "Google Images", "Bing Images" and "Yahoo Images" typically do not have the resolution needed for printing wall murals AND are not allowed to be printed as such according to copyright restrictions. 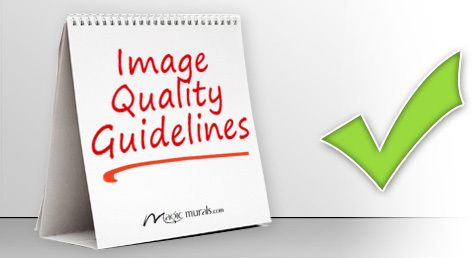 MagicMurals adheres to strict guidelines and policies regarding the use of protected images. • High resolution files purchased from other sources (i.e. Professional photographers, stock sites like "Shutterstock" and "iStock", and "Getty Images") can be good choices for wall murals. Be sure to choose the highest possible resolution file available from these sites. Rights-managed images from professional photographers or stock sites must be accompanied by an authentic statement of approval by the copyright holder or image licensing representative for use. NOTE: Editorial images from any of these locations may not be used for printing wall murals. NOTE: Editorial images from any of these locations may not be used for printing wall murals. • If you wish to make a wall mural of an old photograph or a piece of custom artwork, we recommend having it scanned locally by a professional scanning service in your area. We request scans of a minimum of 600dpi, or preferably 1200dpi using a high quality professional scanner. • With Magic Murals, your imagery is handpicked and custom-fit. Choose from thousands of quality, one-of-a-kind photographs, designs and art that will set you apart. • Our team also knows logos and custom graphics: we can help you find the right approach to adding branding in a beautiful, impactful way. • Save images as high-resolution .jpg's or .tif's for submission to Magic Murals. • Magic Murals can use your company logo to create easy-to-install, affordable corporate branding for your office or workplace! We offer die-cutting services to ensure your logo looks great on any color wall or surface. • We strongly recommend sending in vector logos if possible. Vector art files (.ai, .eps, .pdf, .svg) will produce crisp, clean logos at any size and enable us to die-cut your company logo with no hassle. Please ensure that all requested colors are saved accurately to the vector logo file. • If a vector version of your logo is unavailable, then we will need high-resolution .jpg or .tiff files to produce your logo. Low-resolution logos copied from email signatures, scanned from a business card, etc. will not reproduce well as a logo mural. • Please notify Magic Murals in advance of any Pantone colors or paint colors for matching. 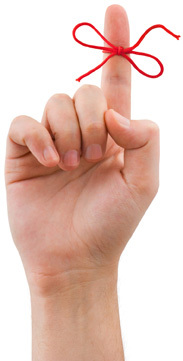 We can work with you to provide a very close approximation of your color, though perfect matches are not guaranteed. If color matching is critical, we recommend ordering custom samples for a small fee to ensure consistency. satisfied with your purchase from Magic Murals, so take the time to send us your best quality images the first time! We look forward to helping with your project. 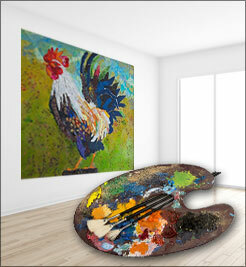 • We can accept .jpg images through our Custom Mural Upload tool. • For all other image file types up to 500mb (.tif, .psd, .pdf, .ai, .eps, .svg, etc) please use our alternative upload tool.